Debby Hughes used this Ink+Wit image once upon a time and I knew I had to have it. 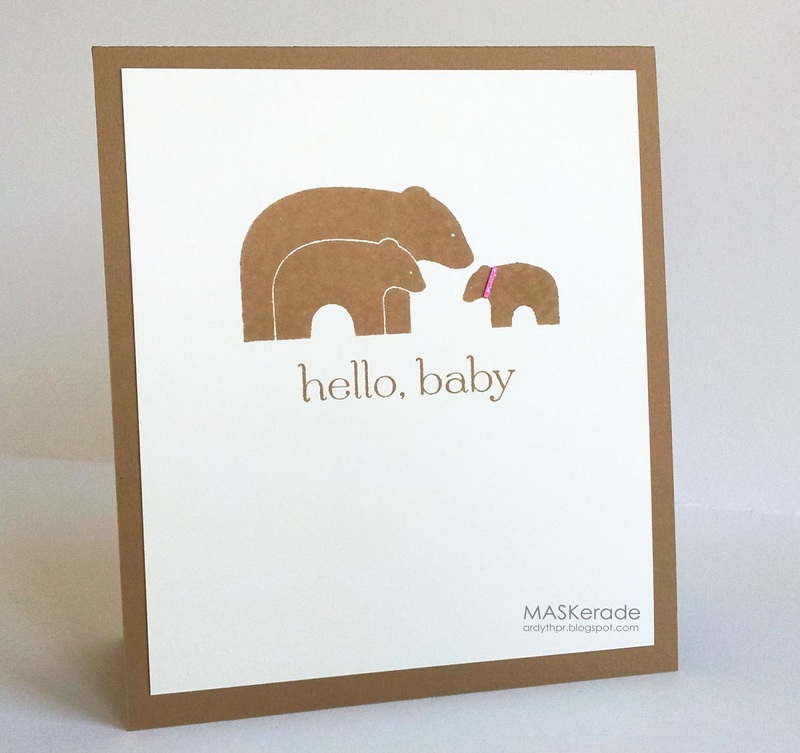 It's perfect for baby cards! And brown (Baked Brown Sugar) and cream is a great neutral colour combination for baby cards. It's especially useful for those baby showers that happen before the baby arrives, but it's easy to add a last-minute tiny pop of colour as I have here if you know what kind of baby it is. The sentiment is from Stampin' Up! This card is neither a 4.25x4.25 square (my favourite go-to size) or a 4.25x5.5 standard card. It's 4.25x 4.875 (that's 4 7/8). There's no science to it - I just felt it was the right amount of space plus it will still fit into a regular envelope. There's still time for you to play along with Muse this week. The deadline is Monday at 8:00 am EDT and then you can vote until Tuesday at 8:00 (even if you didn't get a chance to play along!). Hope to see you there! This is a great take on the Muse challenge. I love the sweet little pink collar! That really is the perfect baby card image and the little collar is so cute! Perfect baby card, Ardyth! Love the pink collar! You are getting an awww...love your one layer card. Fabulously sweet card - I love how you can change it up with the collar colour. The cutest - the pink collar is the perfect touch! That stamp is sooo cute, Ardyth. No wonder you had to have it. That stamp is ADORABLE and the pink collar is so cute. Love it! I can see why you had to have this image, it's incredible and so is your card Ardyth, love how you added that pretty pink collar! UnBEARably adorable, Ardy!! I love it!! This is very clever. Love your take on the muse. It's a wonderful stamp and so perfect for your style! I love the touch of pink! Be still, my heart...so sweet, Ardyth!!! Just gorgeous! I want this set now! BEYOND....WAY BEYOND sweet & cute! I just checked out Ink+Wit (must be living under that rock again, cuz this is news to me!) and the image is sold out. I strongly suspect sales went through the roof minutes after you posted this fabulous card! The sweet wee pop of pink is perfect - especially with the kraft colors! Despite your note on Muse, I voted for you. Sorry, I tried to take it back and it didn't like that much :) This card is absolutely adorable!